Understanding Hip Surgery: Types of Hip surgeries & know the components involved. To understand hip replacement, you need to understand the structure of the hip joint, a ball-and-socket joint. The ball, at the top of the femur (thighbone) is called the femoral head. The socket, called the acetabulum, is a part of the pelvis. The ball rotates in the socket, allowing the leg to move forward, backward, and sideways. In a healthy hip, soft tissue called cartilage covers the ball and the socket to help them glide together smoothly. If this cartilage wears down or gets damaged, the bones scrape together and become rough. This causes pain and can make it difficult to walk. Think of a car, our brake pads allow our car not to walk but drive, the pads (like cartilage) when thinning down to the point hitting metal (not bone) will scrape on the rotors and don’t repair like the cartilage gone hitting bone to bone the damage to the car will scrape on the rotors till they break and new rotors with brake pads needed. Where in patient hitting bone to bone, pain results, limitation of the movement takes place at that area (example Hip) and become immobile. Repair it with surgery and mobilization reoccurs so you can move around like you use to and do regular of activities you previously did. The most common type of hip replacement surgery is called a total hip replacement (THR). 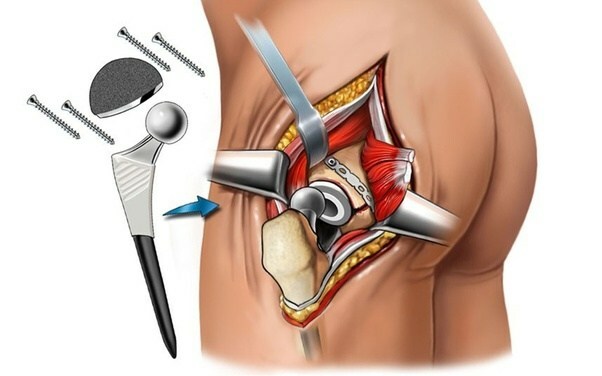 In this surgery, worn-out or damaged sections of the hip are replaced with artificial implants. The socket is replaced with durable plastic or polyethylene cup with or without a metal titanium shell. 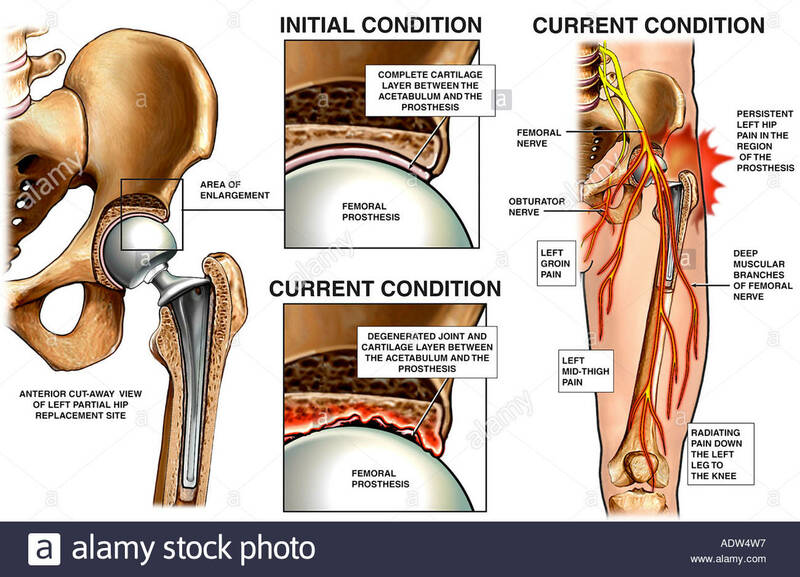 The femoral head is removed and replaced with a ball made from ceramic or a metal alloy. The new ball is attached to a metal stem that is inserted into the top of the femur. Information hip replacements is more easily available than ever before. But direct-to-consumer advertising, online articles and other reports in the media may make it more difficult for people considering these surgeries to understand their options. Becoming familiar with the key considerations that go into selection of the implant that is used to replace the injured or damaged joint can make the process easier. Total hip replacement surgery – in which the damaged joint is replaced with an implant – is associated with a high degree of successful and predictable outcomes. However, some patients may be candidates for hip resurfacing in which the head and neck of the femur are not removed. In this procedure, the surgeon resurfaces or sculpts the femoral head to accept a metal cap with a short stem. Hip resurfacing is usually most successful in male patients under the age of 55, who are larger in stature There is little data to support functional benefit of one type of hip replacement over the other, although if revision surgery is needed, this may be easier after hip resurfacing. It should be noted that while the procedure has vastly improved the ability to treat certain hip disorders with minimal surgical trauma, it is not always an appropriate replacement for other larger operations. If the hip has severe degeneration, total hip replacement may be the only procedure that will provide long-term pain relief. Conversely, in younger patients with skeletal deformities ( i.e. dysplasia, impingement) hip arthroscopy will usually provide relief. But the relief may be short-lived because the underlying pathologic condition has not been corrected. Total Hip Replacement – Total hip replacement is extremely effective at relieving pain and restoring function as well as range of motion. But, it is an artificial joint and should be performed only if other “joint saving” procedures are not appropriate. Osteotomy – Osteotomy (cutting the bone) is a technique were the anatomy of the femur or socket is altered to relieve pain and prolong survival of the joint by reducing the abnormal loads on the cartilage. Fusion – Fusion (arthrodesis) makes the hip permanently stiff by obliterated the joint via bone bridging across the joint. This procedure was performed much more frequently in the past and is still appropriate in certain conditions, such as severe arthritis of one hip in a young person. Arthrotomy – Arthrotomy (opening the joint) is a procedure where the joint is opened to clean out bone spurs, loose bodies, tumors, or to repair fractures. Dr Padgett is a M.D. from 1987 a resident in orthopedic surgery at Hospital for Special Surgery (HSS) to chief of the Hip Service, and in 2008 to the present chief of the Adult Reconstruction and Joint Replacement Service at HSS. Learn much more about him in tomorrow’s topic with an excellent hospital to go to if you need this in N.Y.C. If not you can also find out where to go for help in finding excellent hospitals in hip surgery out on NY to California. Knowing your components is very helpful. Hip implants come in two primary types: the traditional single-piece implants and modular models, in which the stem and head of the implant portion that is placed in the femur can be matched independently. Although the single piece implants provide a good fit for many patients, “modular devices were developed to improve the fit of the implant to the patient’s specific anatomy,” explains Dr. Padgett. However, he adds, some modular implants have recently been found to be associated with problems related to the linkage between the various parts. Some degree of corrosion and fretting has been seen with these metal on metal components, a process that can result in the creation of metallic debris that is destructive to the soft tissue surrounding the joint. As a result, some of these implants have been recalled. Metal or ceramic on polyethylene, in which the metal or ceramic head meets a medical-grade polyethylene socket or acetabulum in the pelvis. This combination is now generally regarded to be the “gold standard” for hip replacement. The polyethylene components currently in use are significantly more wear-resistant and resistant to degradation than earlier generations of these plastics. Metal-on-metal, in which a large metal ball at the top of the femur articulates with a metal socket or acetabulum in the pelvis. This combination was originally developed to offer the benefits of increased stability – related to the size of the head – and the ability to create a very thin, but durable metal shell. Owing to the creation of metal fragments or metallic debris that is destructive to the soft tissue surrounding the joint, use of some of these total hip replacement implants has been discontinued in the United States. Metal-on-metal bearing surfaces continue to be used for hip resurfacing. Ceramic on ceramic, in which both components are made of the same material; this combination has been shown to have good durability, but there is a risk of the ceramic breaking and ceramic on ceramic hips can produce an audible squeak. 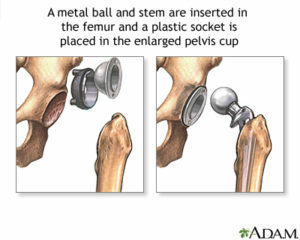 Placement of the hip implant components involves an additional consideration: how the implants are bonded to the bones. This can be accomplished either through the use of acrylic cement or with uncemented fixation, in which the surface of the implant is composed of a porous, honeycomb-like surface that allows for the in-growth of new bone tissue to help hold the component in place. “On the cup portion of the implant, uncemented fixation is clearly superior,” Dr. Padgett a orthopedic M.D. and from 2008 says. “However, cemented fixation may be preferable in older patients or others with compromised bone quality.” With regard to fixation of the stem, Dr. Padgett notes, available data shows no advantage of one type of fixation over the other, and the decision to use one over the other is left to the surgeon’s discretion. With a history of excellent surgical technique and outcomes, the focus of new development in this area is on the use of enabling technology to improve preparation and component positioning in hip and knee replacement surgery. These tools include navigation devices that provide three-dimensional spatial orientation and robotics which can also provide tactile feedback during surgery. “The role of these emerging technologies is still evolving,” Dr. Padgett notes. Much of the important early work in the development of successful hip implants took place in the late 1960s and early 1970s, including that of British surgeon John Charnley, MD and introduced at HSS by Philip D. Wilson, Jr. MD.